The World Series of Poker (WSOP) came to Australia as the inaugural World Series of Poker Asia Pacific made its way to Crown Melbourne in April 2013. The 2013 WSOP APAC schedule contained five championships events with the WSOP APAC Main Event featuring a $10,000 buy-in. 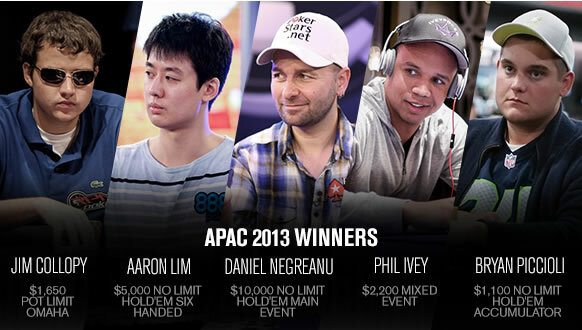 All of the news and results from the 2013 WSOP APAC can be found on the links below. The World Series of Poker Asia Pacific returns again in 2014 with ten bracelet events set for the 2014 WSOP APAC schedule. The 2014 WSOP APAC will be held in October 2014 and then every two years thereafter. Stay tuned to Poker Asia Pacific for the latest news and updates from the WSOP APAC.